Currently ThePuriTea.com is offering Free Shipping On Orders $50 Or More. To make it even better you'll receive a Free Sample On All Orders. If you're not satisfied you can simply return your order. If you're new to the world of tea but ready to take the plunge you might want to start with the Tea Starter Kit. While you're at it pick up some of the fans favorite Golden Yunnan Tea. 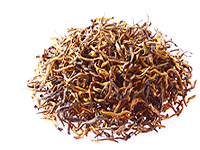 Also known as “Yunnan Gold,” Golden Yunnan is a coveted black tea from Yunnan, China. The finish is remarkably clean, with notes of honey and malt. Try it with dark chocolate desserts, plum tortes or lamb with apricot chutney.